Save on Blackberries at Smokey Robinson Foods. Top brands include Dole. & Dole. Hurry! Limited time offers. Offers valid only while supplies last. 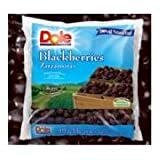 Dole Whole Individual Quick Frozen Blackberry Fruit, 5 Pound - 2 per case.